Food Bank Founder and long-time supporter, Linda Locke, passed away on Christmas Eve. In celebration of the gift she gave our community, we share with you a little background of her early days in food banking. Linda Locke was a graduate student, wife and mother when she got the assignment of a lifetime in 1975. While working for Contra Costa County Social Services, she was tasked with finding a way to prevent central county food pantries from running out of food before the month was over. Her early work developing a food program called the Community Food Coalition grew to become the Food Bank of Contra Costa and Solano you know today. Linda was always driven by her passion to help others, so she took off running. At the time, approximately 370 families needed help with food each month. Linda personally spoke with each pantry in the county to see what was needed to strengthen their service. The answer was collaboration. Create a primary fundraising source for food acquisition. Increase the size of food donations and receive wholesale pricing, since no one pantry could achieve this alone. Store the food in a central warehouse that pantries could access as they had the capacity. Linda was never shy and used her love of public speaking to acquire distribution trucks and large-scale food donations. She was also instrumental in the creation of California legislation to ease the liability of companies who donated food in good faith. Linda was relocated to other areas of county work in 1976, but her short time in food banking created a lasting legacy. Executive Director Larry Sly recalls, “She created a food bank out of thin air.” The Community Food Coalition went from enough food to provide 30,000 meals in a year to our current organization providing 18 million meals a year. Photos: Top left: Larry Sly, Linda Locke and Ed Rimer, the first Executive Director of the Food Bank. Bottom left: Juan collecting onions from a local grower. Right: Linda at the 40th-anniversary celebration of the organization she started. The folks at Red Nose Day (RND) recently reached out to the Food Bank and asked us to speak to a classroom of third graders in Brentwood. They told us how Gabriel, a student at Krey Elementary, was the winner of their national contest challenging students to come up with ways they could help children living in poverty. He and his teacher, Mrs. Berry, won a trip to New York City to attend the RND televised special. When they returned, Lisa Sherrill, the Communications Director at the Food Bank, went to the school and gave the class an overview on how food banks operate and why they are needed. Lisa shared with the class that 1 in 8 people living in Contra Costa and Solano counties turns to the Food Bank each month in order to get by. She helped the students count off in eights to give them a visual and better understanding of hunger’s magnitude. She also discussed ways they could get involved including by volunteering at a Family Food Sort or by donating food. The students were quite excited to share the surprise they had waiting for Lisa! Together they walked to the class’ garden on a small corner of the campus and showered her with produce they had grown themselves. They generously donated 17 pounds of cabbage, lettuce, carrots, and broccoli to the Food Bank because they wanted to give it to people who don’t have enough healthy food to eat. We are grateful for the food and inspired by the compassion shown by Gabriel, his hunger-fighting classmates, and their teacher who started the garden at the school! According to the Centers for Disease Control, the current flu season is the worst in more than a decade, prompting widespread hospitalizations, outpatient clinic visits, and missed school and workdays. We all know that a key to good health is good nutrition, but as we brace ourselves for several more weeks of flu season, many families will struggle to put food on the table. That’s where the Food Bank comes in. Our goal is to not just feed the 182,000 people who have to turn to us each month; we want to provide them with healthy food. The Food Bank’s focus on nutritionally-packed produce has grown to new heights. We now distribute fresh fruits and vegetables 7-days a week, year round. In fact, fresh produce now accounts for nearly 60% of the total food we serve the community. Our recipients, including children and seniors, especially benefit from nature’s immune-boosting food as viruses run rampant during the cold and flu season. When it comes to purchasing shelf-stable pantry items, the Food Bank evaluates the nutritional value and takes into consideration the overall content of sugar, salt, vitamins and minerals in each item. We opt to buy healthier food options that include beans, brown rice, lentils, whole wheat pasta, low-sodium or sodium-free canned goods, and canned fruit in 100% juice (rather than syrup). With the ongoing support of neighbors like you, we can provide a steady supply of fresh and whole foods that help support good health and immunity for our entire community! It’s important to us to be transparent with our valued supporters. The 2016-2017 fiscal year recently came to a close and the numbers are in. Here’s a brief breakdown of what those figures mean. We met our revenue goals thanks to generous community support. Fresh produce now accounts for a record-high 58% of the total pounds of food distributed. Food donations from food drives increased by 20%. Community Produce Program on track to add new sites and increase distributions to seven days a week this quarter. New partnerships with healthcare professionals are allowing us to nourish even more people in need. Over 100,000 individuals in Contra Costa and Solano counties rely on CalFresh to put food on the table. The current proposed massive cuts to this federal program would increase hunger to a level that the Food Bank simply couldn’t mitigate. from 76% unfulfilled last year, the need is still dire. donated goes towards food programs. VOLUNTEER – Sign up to volunteer by visiting foodbankccs.org/volunteerfairfield. 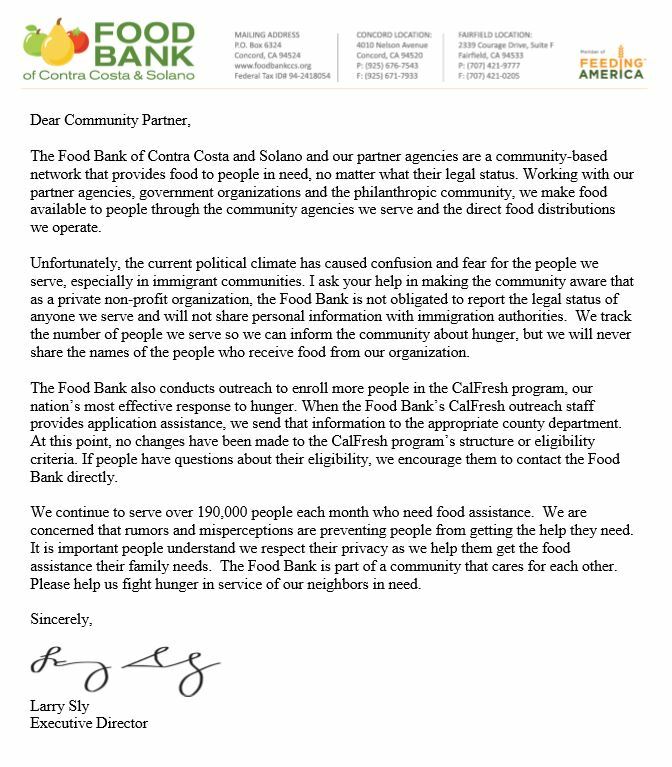 In response to current uncertainty about possible changes to assistance programs, the Food Bank of Contra Costa and Solano’s Executive Director has released a public statement on the Food Bank’s commitment to provide food to anyone in need of assistance – regardless of their immigrant status. Read the full letter here. Please reiterate this message to anyone who expresses fear in coming to the Food Bank distribution and share it with any relevant community partners. Thank you for your support to end hunger, and please reach out with any questions you may have. Each December, Diablo Magazine’s annual Threads of Hope Awards recognize an amazing group of volunteers who go above and beyond to make the East Bay a better place. We are thrilled the Food Bank’s long-time volunteers, Vic and Fran Smith were honored in their 2016 ceremony. We are thankful for their many years of service and the joy they bring to our warehouse workers, volunteers and of course, the children they help serve. Looking back, it’s the Easter baskets that Fran and Vic Smith remember most. After a lifetime of volunteerism that has included such activities as sorting through donated books at the Orinda Library, building houses and playgrounds in remote Mexican villages, and boxing food for children at the Food Bank of Contra Costa and Solano, the Smiths light up when they talk about their Easter basket program. This year—their 10th making the colorful baskets for children in need—the Smiths assembled 100 baskets. This project is just a drop in the proverbial basket compared to the contribution the Smiths have made to the food bank during the past 15 years. Two to three Fridays each month, in a 32,000-square-foot warehouse in Concord, the Smiths have served as the heart and soul of the Food for Children “boxing team,” which assembles more than 700 boxes of food a month for children ages four to six. Using an assembly-line process, the boxing team fills large cardboard boxes with nutritious, kid-friendly food—cereal, peanut butter, canned tuna, pasta and sauce, rice and beans—then the food bank staff distributes them at nine sites across two counties. Recently, the Smiths wondered if they should slow down just a bit and talked about not volunteering at the food bank anymore. The members of their boxing team wouldn’t hear of it, declaring a “Fran and Vic Day” to discourage them from leaving. The Smiths decided to stay with it. How you can help: Donations can be made to the Food Bank of Contra Costa and Solano at foodbankccs.org. Originally posted on the Vacaville Reporter: We have just had one of the most contentious elections I can remember. Many people believed strongly in the candidate they preferred and had little positive to say about their opponent. Political differences will always exist, as they always have, and people will always want to advance their point of view. What gives us hope today is that people on both sides say they believe in American democracy and are committed to working together for the good of the county. Gerald Ford was president when the Food Bank of Contra Costa and Solano came into existence. We continued to feed people in need through the tenure of the next six Presidents, with three of them being Republicans and three of them being Democrats. The Food Bank has been able to withstand the changing political tide over the last four decades because the reality is that the Food Bank receives very little government financial support and relies mainly on the local community for our funding. In fact, less than 10 percent of the annual budget is from government contributions. With that said, our work is influenced by national efforts to address the needs of hungry people in our community. We speak with authority to our local elected officials that there are 190,000 people EACH MONTH in our area who need our help to obtain food. We rely on our representatives to relay that message to Washington D.C. that we serve 1 in 8 of our community members and we can’t do it alone. The food distributed by the Food Bank to low-income children, seniors, individuals and families in need is in supplemental quantities. For some, that’s enough to get by. However, others need additional assistance, which is why we advocate for public policy that helps assure everyone has access to adequate amounts of nutritious food. We work with county governments to help increase participation in the CalFresh program, the first line of defense against hunger. We also have strong relationships with school districts and advocate for the continuation of the federally-assisted National School Lunch Program and School Breakfast Program. We want to do our part to ensure that low-income students get the meals they need to succeed and thrive to help the future generation. While the Food Bank of Contra Costa and Solano — and Feeding America (our national network of food banks) — prepare to work with newly elected officials, we remain dedicated to meeting the needs of the hungry people we serve. We encourage everyone to help create the community they want to live in — a place where no one has to go to bed hungry. If you’d like to donate to the Food Bank this holiday season, please visit foodbankccs.org/holidays. Originally posted on Sustainable Contra Costa: For dedicating over forty years to feeding the hungry and being a model of sustainability in our local community, Food Bank Executive Director Larry Sly received this year’s Lifetime Achievement Award from Sustainable Contra Costa. Larry was presented with the award at the 2016 Leadership In Sustainability & Green Building Awards on September 21st, 2016. Larry began his work at the Food Bank of Contra Costa and Solano soon after graduating from UC Berkeley in 1976, during the second year of its establishment. He was initially hired as a truck driver when the Food Bank’s warehouse was nothing more than a Safeway trailer in a church parking lot. Before long, the Food Bank’s leadership was transferred to his capable and generous hands. In his first year with the Food Bank, 36,000 pounds of food was distributed. Today, with Larry as the Executive Director, the Food Bank serves one in eight residents of Contra Costa and Solano counties. Twenty million pounds of food is now distributed each year, over half of which is fresh fruits and vegetables. Seeking to both reduce food waste and feed hungry people, Larry ensures that produce that would otherwise go to waste is instead given to local families in need. He has developed an innovative Grocery Recovery Program where the Food Bank’s trucks and agencies pick up leftover food at local grocery stores that would otherwise be thrown away and then distribute it to people who need it. In addition to diverting healthy food from agriculture and industry that would otherwise be discarded to those in need, Larry is also dedicated to sustainable business practices within the Food Bank. The Food Bank recycles all paper, plastic, aluminum, cardboard and plastic bags from food drives. We have installed solar panels on top of our large warehouse in Concord, reducing our electric bill by thousands of dollars each month. Energy is saved and excess funds are diverted to feeding more people. Congratulations Larry for receiving this year’s Lifetime Achievement Award! It is well deserved. Originally posted on The Vacaville Reporter: As some families are packing for their summer vacations, others are worried about how they are going to put enough food on the table for their children. During the school year, over 65,000 low-income children in Contra Costa and Solano counties receive free or subsidized lunches. Students receive their mid-day meals through the National School Lunch Program. It is administered by the U.S. Department of Agriculture and many schools have breakfast and snack programs as well. These programs benefit children, parents and even teachers, as it is difficult to teach hungry students. Children (and adults) lack focus and energy when their bodies are not being fueled properly, making it hard to learn and retain information. The USDA also runs the Summer Lunch Program, which provides funding and food so schools can continue providing lunch over the summer break. Unfortunately, in most districts, while there may be a Summer Lunch Program, there aren’t summer school programs in session to draw children to the school grounds. The creative minds in each district’s food service program have come up with ways to continue providing food to hungry kids over the summer. Some schools have mobile food trucks that go to parks in low-income areas where children gather and they provide them with meals. Other schools provide meals at public libraries, where children often spend their summer days. School districts want to reach students at these common summertime gathering areas, so they can provide the children with healthy lunches. These methods help, but they aren’t reaching all the children in need. One of the challenges that schools face is that, in some neighborhoods, parents do not want their children walking alone to a summer meal site. Because of USDA regulations, a parent that accompanies a child to a distribution site is not able to eat a meal. In many cases, if the child has a little sibling that is too young to attend school, they also have to go without food. In some cases, parents and siblings are not even allowed to sit with the student while the student eats their lunch. Obviously these regulations discourage, rather than encourage, participation in the Summer Lunch Program. We all know how important it is for children to receive proper nutrition on a consistent basis. Their bodies and brains are developing and food is essential. Skipping meals on a regular basis can have long-term detrimental effects. To encourage an increase in participation in the Summer Lunch Program, the Food Bank is working on a demonstration project this summer. It is funded by the Y&H Soda Foundation, an organization that supports nonprofit organizations committed to the well-being of the underserved. This project will allow us to pay for meals that parents and siblings eat when they bring their school-age child to a Summer Lunch Program site. If we can show that the Summer Lunch Program can be a positive family meal, we hope to initiate a broader discussion about the benefits Summer Lunch can give when we help provide food to families in need. Originally posted on the Vacaville Reporter: Since the Food Bank of Contra Costa and Solano provides over ten million pounds of fresh produce each year to people in need, we are extremely concerned about the impact the drought is having, and will have, on our mission. Not only is California’s water supply decreasing, but the cost of fuel is increasing. These two factors make for the perfect storm for a hike in the cost of providing healthy produce to people in need. As members of the California Association of Food Banks, we have access to an enormous supply of fresh produce from the agricultural community. Over the years, we have increased the amount of fresh fruit and vegetables that we provide to the point where it now accounts for more than half of our total annual pounds of food distributed. Our Farm to Kids program brings produce to after-school programs in low-income schools. Our Community Produce Program brings fresh produce to clinics, schools and churches in low-income communities throughout Solano and Contra Costa counties. Produce is also available to the nearly 200 nonprofit agencies we partner with, so they can provide nutritional assistance to the people they serve. On the positive side, we are still able to receive the fresh produce that we need. The California Association of Food Banks is able to offer us 10 to 12 different produce items on a consistent basis. But we constantly have to make choices about the food we receive, based on increasing costs that are often related to the drought. When we began receiving produce, we had to match what alternative markets were paying, generally around five cents a pound. Many of our costs now begin at six to seven cents a pound. Some items can cost us 10 to 14 cents a pound. Celery, for instance, is now priced out of our range at 20 cents a pound. Our ability to help people in our community is also impacted when fuel prices go up, as they are currently. We are lucky that our warehouses are so close to agricultural resources, but we need to make choices about how far we are willing to transport certain items. Apples are available to us for four to five cents a pound, but they must be transported from Yakima, Washington. In order to receive a 34,000-pound load of apples, it costs us nearly $1,300. A 42,000-pound load of potatoes from Tulelake, Calif., costs more than $1,400 to ship. We have hard-working staff members who always take these factors into consideration when purchasing the produce we need. We have built an effective system of food distribution that we are committed to maintaining, so we must continue to balance the rising cost of food and transportation. We are encouraged that healthy produce is still available, but we know that we need to raise more money to offset these price increases. We are thankful for our generous donors who provide financial support. Like us, they also believe that our entire society benefits when everyone has access to good nutrition. Originally posted on the Vacaville Reporter: When we think about disaster response in California, we recognize the threat of fire, drought and tsunamis, but our main concern is earthquakes. With the 6.0 magnitude Napa earthquake that took place last year, and the small earthquakes that have hit the area more recently, we are constantly being reminded that we need to be prepared. When we watch the news about the earthquakes in Nepal, we are reminded of the devastation these natural disasters can bring to a region. This is why the Food Bank of Contra Costa and Solano is committed to preparing for the role we will play for any disaster in our community. The first time local food banks responded to a major disaster was after the Loma Prieta earthquake in 1989. The food banks in the Bay Area banded together to help the food bank that was serving Watsonville. They were overwhelmed by the damage in their community. We had an incredible response from a generous community that enabled us to accept disaster donations from Feeding America, the national food bank network. We stored those donations for the people in Santa Cruz County and helped meter the flow into their food bank. After Loma Prieta, with the support from the San Francisco Foundation, we worked with consultants to develop a comprehensive disaster plan for the Food Bank. We developed a business continuity plan to assure that the Food Bank can continue to provide service in our local community. But as we looked at this local plan, we realized that we needed to have a regional plan for disaster response in the Bay Area. We had to think about where would we look for help if a disaster limited our ability to assist our local communities. We also needed to consider what we would do if the food bank in Alameda or San Francisco were not able to operate. All of the food banks are already dealing with the crisis of hunger in local communities on a daily basis. The need for food will obviously get significantly worse where a disaster occurs, but the food banks in areas that escape harm will still need to meet the daily needs of feeding members in their communities. The Bay Area food banks developed a memorandum of understanding among one another that outlines what we would do to assist each other when a disaster occurs. We also keep that commitment alive by continuing training for table top exercises to practice how our mutual support will play out. There is no question that another major earthquake will happen in the Bay Area. Roads will be damaged, electrical and water systems disrupted and property damage will occur. From our experience with Loma Prieta and other disasters, we know that people pull together in time of need. The Food Bank of Contra Costa and Solano is prepared to help other Bay Area food banks when a disaster occurs, while we continue to help our local community too. Originally posted on The Vacaville Reporter: One in eight residents now relies on the Food Bank of Contra Costa and Solano and during the holidays we work with our more than 180 partner agencies to bring additional hope and relief to our neighbors struggling with hunger. This Thanksgiving and Holiday season we will provide food for over 14,000 meals and about 30,000 grocery baskets to your neighbors in need. Thanks to amazing community support through monetary donations and food drives, we can make the holidays more hopeful for children, families and seniors who struggle to put food on their tables. We have a tradition going back longer than I can remember coordinating food drives with Safeway. Obviously, there is no better place to do a food drive than a grocery store. Years ago, Safeway let us place barrels in stores and we did all we could to urge people to donate. Other corporate sponsors helped us purchase colorful wraps to go around the barrels. We put the types of food we most wanted on the barrel wraps and on flyers. Volunteer groups passed the flyers out to shoppers as they went into the stores. Those efforts produced thousands of pounds of food donated by a generous community. For the last five years, NBC Bay Area has partnered with Safeway to help stock the shelves of local food banks. In addition to providing on air promotion, the station enlists hundreds of volunteers – including NBC Bay Area anchors and reporters helping at their own neighborhood Safeway Stores –to encourage shoppers to donate food items. NBC Bay Area is once again teaming up with Safeway Stores for a one-day food drive on Saturday, November 22, kicking off a month-long effort to fight hunger with Bay Area Food Banks, a collaboration of seven food banks serving over 780,000 local residents each month. The “Help Us End Hunger” food drive will take place at 155 Safeway locations throughout the Bay Area making it easy for community members to participate and help feed their neighbors in need. To make the donation process easier, a specially produced shopping bag filled with items that food banks need the most will be available for $10 at all local Safeway stores. Items include pasta and sauce, canned vegetables and important protein items like peanut butter and canned tuna. Once collected, the bags will be delivered to food banks for distribution to needy families. The bags will be available for Safeway shoppers to purchase now through December 25. The holiday season is the time everyone can help their neighbors in need. NBC Bay Area, Safeway, Kiwanis clubs, scout troops, other community organizations and the entire community helps make a difference, each in their individual way. We thank NBC Bay Area and Safeway for bringing attention to the severity of local hunger and for creating a simple way for anyone in our community to help a family in need. The Food Bank and our partners are feeding people in every neighborhood and you can donate to make a difference in the lives of people in your community.